The lifting, handling and craneage equipment manufactured by J D Neuhaus is powered by compressed air, with the option of hydraulically powered products also being available. These power mediums ensure the equipment is safe to operate in areas where potentially explosive atmospheres can occur, such as in oil and gas, refineries or chemical facilities. The products are also suitable for applications where high levels of inflammable dust can occur including mining, cement production and milling. Additional spark-resistant features can also be accommodated to cover ATEX Division 1 and 2 applications. 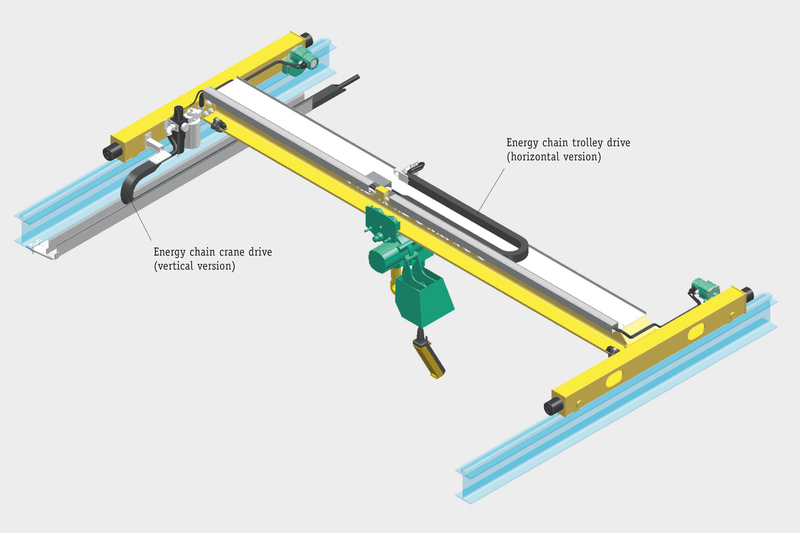 A variety of energy feed systems can be fitted to the JDN products where a permanent power supply is required for moveable trolley-mounted hoists or monorail hoists running on overhead support beams. An economic spiral hose energy feed line can be supplied, supported by small trolleys running on galvanised square bar or C rails which are mounted to the upper flange of the overhead hoist beam. The spiral hose is supported on a plastic coated rope attached and tightened parallel to the main beam. This is suitable for travel lengths of up to 10 metres, but it is recommended that the fully extended length of the spiral hose should always be 50% greater than the actual running length required. 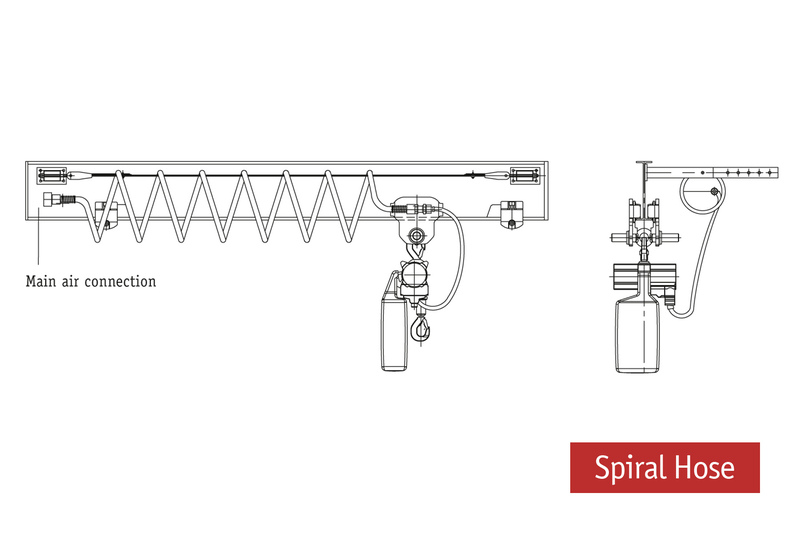 The spiral hose can be used in category 3 (zone 2), with gasses of explosion groups IIA and IIB. It should not be used in category 2 (zone 1) or group IIC applications. Where the installation involves a short running length, or where there is not sufficient space for fitting a separate square bar or C rail, then an alternative hose energy feed supply fitted with its’ own support trolleys can be fitted. These hose support trolleys roll directly on the bottom flange of the overhead hoist support beam. Any horizontal movement of the hoist is accompanied by an appropriate extension of the power feed hose being supported by the free-rolling trolleys. Installation of either hose system is simple and cost efficient, with mounting accessories provided as required. The square bar mounting is also suitable for curved track applications. The energy chain guide channels and appropriate clamping systems are provided, with the power supply hoses for hoist and trolley motors, together with crane movement and control functions being safely contained within. 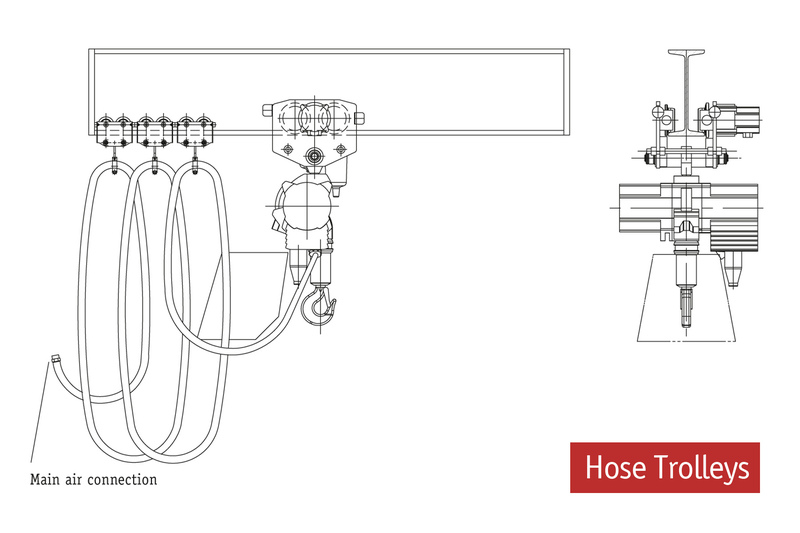 Additional control hoses and electric cables can be housed in the energy chain systems if required.